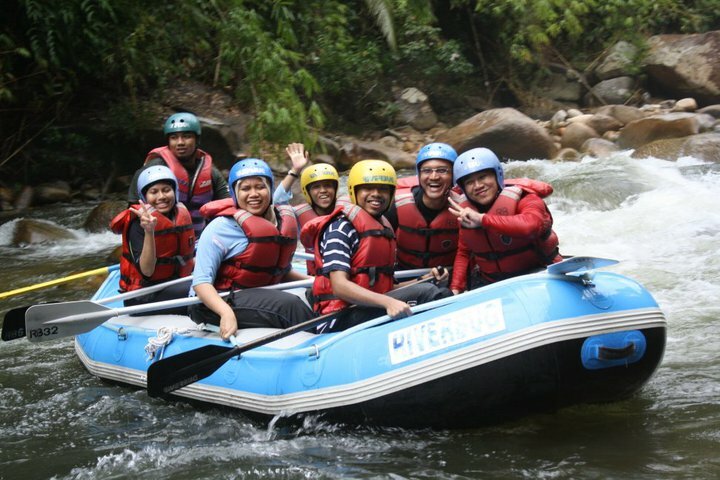 For this trip, we only payed RM90 for the adventure package and RM30 for transportation by bus. What a deal! Thanks PEERS! We were supposed to assemble at KLCC and depart at 7am. But being Malaysians, we took off at around 8am instead :-p Because it was still early, most of us hadn’t had breakfast yet. There was a total of 40 participants. We had a pit stop at Rawang R&R for half an hour, then moved on to our destination. 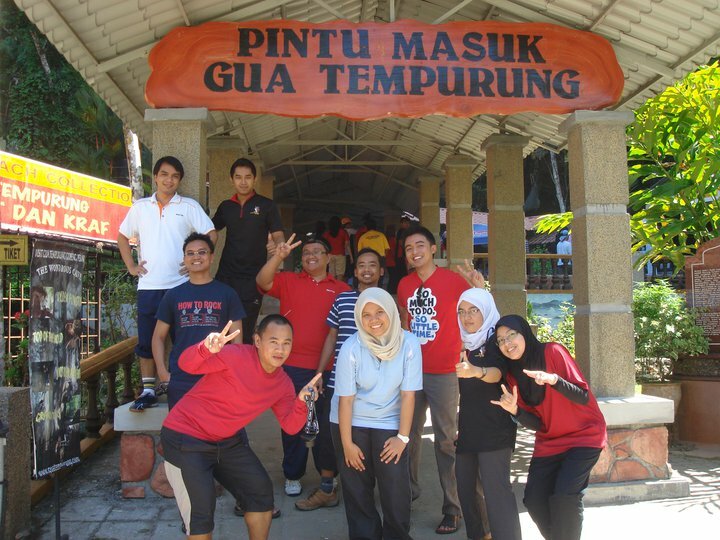 We took the Gopeng exit, and finally arrived at Gua Tempurung at around 11am. I had experienced caving at Gua Tempurung before back in 1995, while in high school. I remembered at one part, we had to crawl in the river water, we got our clothes really dirty. So I had on me erm, eheh, a free teambulding t-shirt that I don’t mind discarding if it gets way beyond recognition lol! We took the Top of The World & River adventure which took about 2.5 hours where we had to climb a flight of stairs (680 steps!) then return via an underground river where we had to slide down the rocks which was about 5 meters deep (this is a dry slide down), then squeezed down through a hole (not as small as Batu Maloi’s – Batu Maloi's is waaaay tougher) and crawl in the river through a very shallow tunnel (we had to almost dive). But it was fun, and the water was cool and refreshing. Our guide explained some funny looking rock shapes, according to his very wild imagination! There was Osama bin Laden, chicken drumstick, a ghost, monkey riding a vespa with a helmet on, a pregnant lady, a lady washing her hair etc. I must say, they really have a lot of time to observe the rocks! Our guide also showed us a spot where the stalactite (hanging from the ceiling) flows water 24-7. The water comes from the rock. There was also a spot where it is windy and very cooling. He explained that the wind came from the cave entrance, but was only felt there as it was a confined space where the wind can be felt. A COP session was going on in the cave courtesy of our senior Geophysicist – Mr Kamal. He sure was very enthusiastic about rocks! And since I am on Geofantasy mode, I paid some attention to him. Though the rocks look like marble, they are not, they are carbonates/limestone and are easily dissolved, and they are also relatively virgin. Marbles come from metamorphic rocks which are more stable. By the way, it was not the bat season right now, so we didn’t see any bats or stepped on guanos (bat droppings) – I think! Or maybe we did lol! I didn’t smell any sulphur-like pungent odour though, so I think there was no guano lying around. 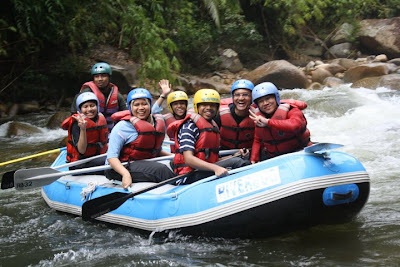 After a hearty lunch of nasi putih with ayam masak merah, sayur campur, pajeri nenas & udang masak lemak, we were ready to roll for our White Water Rafting adventure! This is my second WWR adventure. 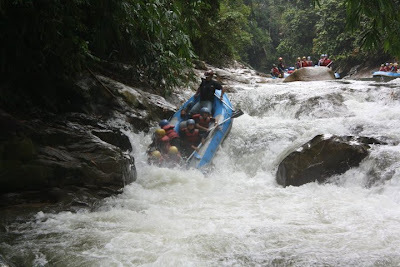 Check the first one at Jeram Besu, Pahang here. 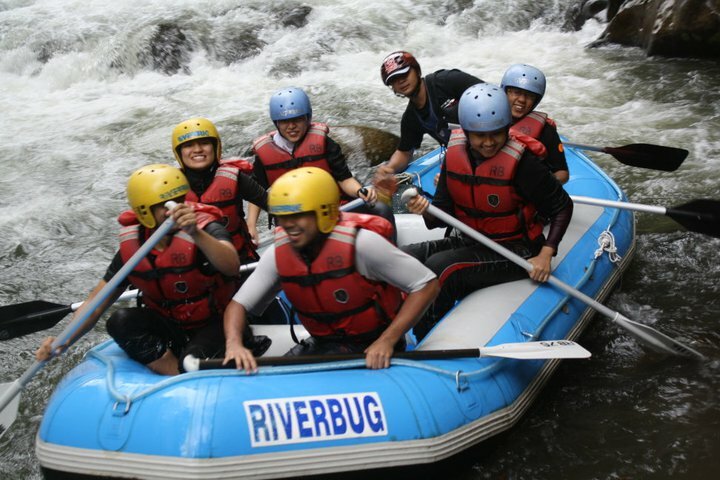 This second one is more exciting as the rapids are faster. 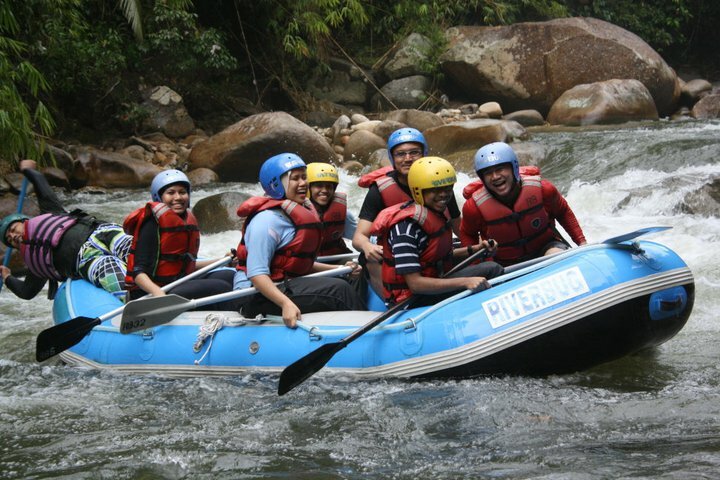 The first one I went was during the dry season, so we had to paddle more. Ah memories of taking the van sayur at Cameron came gushing back :) We took an open top lorry ride to Sg Kampar from Gua Tempurung, for about 30 minutes (I think). Nizar said it was so thrilling he didn’t feel time passed lol! We had to dodge the vegetations along the way (I finally gave up and sat down instead). We passed by a very nice kampung –Kg Jahang with fish ponds and kampung houses. We all agreed it would be nice if we could build a house and stayed there! When we arrived at Sg Kampar for the WWR adventure, it was raining. Some were very excited as rain meant more rapids, some were quite concerned. We were then briefed by the very capable instructor – Max. He explained on our sitting positions in different situations (jump jump, boom boom) how to paddle (front & back paddle), and how to react if were thrown overboard (just float facing downstream and cycle while floating, and wait to be rescued with the lifeline) and of course, the high five, paddle style. Ah a tip if you’re facing an attack: If the attacker is trying to overturn you from the right side, everybody huddle to the right so it’d be too heavy to be overturned (and vice versa). Or you could do the “jump jump” i.e. jump on your seats together-gether. There was only 1 major rapid - the chicken rapid, if I remember it correctly, but since it only started to rain when we were arriving, there was not enough current to overturn our rafts. So all teams survived! We finally finished our adventure at around 6pm. It was really cold, and we were all hungry again! We returned back to base (at Gua Tempurung), showered and changed, and finally left Gua Tempurung at 7pm. We stopped by for dinner at Tapah R&R, and finally reached KLCC at 10.30 pm. Whoa what an adventure! Such an excellent adventure! Thanks PEERS!